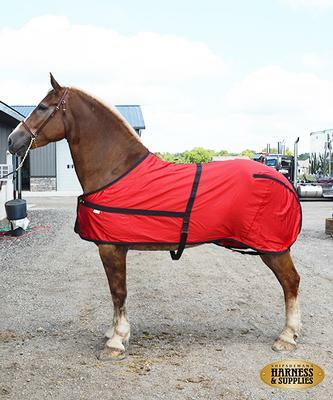 These blankets are made to fit the contours of Draft Horses and manufactured exclusively for us made in the USA. The Satin blanket is great for using at shows! Washes up very well and, most importantly, they are breathable! They have elastic leg straps with swivel snaps, two inch wide belly band and a bungee front closure. To assure a proper fit, measure horse from center of chest to tail then add 6". To measure for a Showtime blanket: using a flexible tape start at the center of the horses' chest (see A) and measure around the part of the hoses' shoulder along the barrel and to the center of the tail (see B). Keep the tape horizontal to the ground. Showtime brand blankets require adding 6 inches to that measurement. For example: If you measure your horse to be 90 inches then you will need to order a size 96 blanket. To clean your Showtime blanket, fasten the leg straps and Velcro belly band fasteners before washing. Wash in lukewarm or cold water using a mild detergent. Do not dry clean. Hang up to dry. If using a dryer, do not dry on high heat and only dry for 5 minutes - then allow to air dry. Mane Saver~Light weight hood cover.